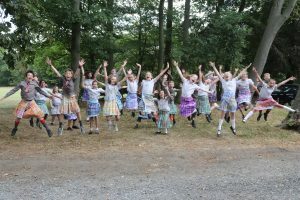 Home > News > Form 5 & 6 > Kilted Out! Forms 5 and 6 have created their very own kilts with Mrs Smith in their Art lessons this term. With the help of the wonderful Mrs Cook, the children have created these brilliant garments which they kindly modeled for us afterwards! The kilts were made in the children’s Art lessons to coincide with their focus on the Stuarts in their learning challenge this term. Each child was given a piece of lino to carve and create lines in which they then used as a printing block. They dipped the lino in paint and made their first print on their fabric. Each print needed to match up to create straight, continuous lines. 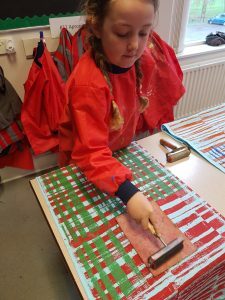 Once they had finished printing in one direction, the children had to start then turn their printing block 90 degrees, use a different colour paint and print across their kilts again to create the tartan look. Textiles is the latest addition to the expanding creative arts curriculum at Ghyll Royd. Forms 3 and 4 created some fabulous embroidery work in their lessons this term and Forms 1 and 2 produced a gorgeous giant felt mural which will hang in the entrance to Greystone Manor for all to see from next term. Thank you to Mrs Smith for your always innovative and exciting Art projects that the children really engage with and enjoy. Thank you to Mrs Cook for your help. Well done to Forms 5 and 6 on your wonderful work. See all the pictures on our Facebook page.